Pumpkin is true favorite of all the Fall/Winter squash that are out there. Pumpkin reminds me of early Fall, the county fair, Halloween and jack-o-lantern carving, Thanksgiving and good food and lots of love with family and friends. Pumpkin also makes a wonderful food for babies as young as 6 months old. This nutritious gourd is packed full of Vitamin A and lots of beta carotene. Pumpkins are also good sources of potassium, protein, and iron. The seeds of the pumpkin contain protein and iron so don’t throw them out – roast them and serve them to the older kiddos for a tasty snack! 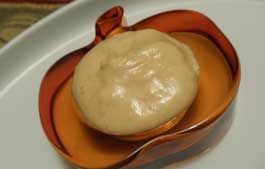 This recipe for quick and simple pumpkin dip is very versatile and would be suitable for babies 8 month and older who have had dairy products without any issues. As always, you should consult your baby’s pediatrician about any foods you wish to feed your little one. Enjoy! That’s it – yes, really that’s it! You’re all done 🙂 That was easy peasy wasn’t it?! Serving Suggestions: Please be sure to serve this according to your baby’s age and stage! Mix into oatmeal, sweet potatoes, rice, quinoa, applesauce and even into pastina!